Are you looking for a fun way to work on sentence structure!? 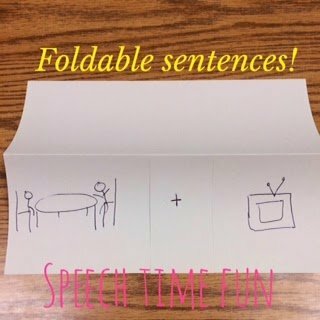 I love using foldables in my speech room. All you need is a piece of paper, pen/pencil/crayons/markers, and scissors! That is it! Who doesn’t have those materials readily available?! Students can also work on following directions while creating these activities! 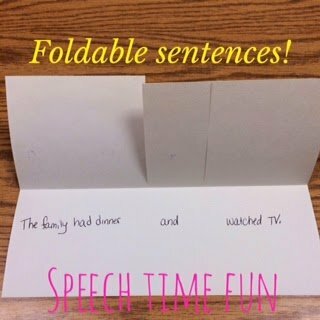 I decided to create a foldable to work on sentence structure! You can easily work on any sentence structure goal with this! I have many students working on combining sentences and using conjunctions so, above you will see what we did! That is the foldable open (only because it was hard to take a picture folded, it wouldn’t stay flat!). As you can see, we folded the paper in half (I did it the long way to make more/longer pieces). Then we cut the paper twice to make 3 pieces. As you can hopefully see, the middle piece is the smallest. I like to have my students use the top side as an illustration. Then when you lift each flap, students can write the parts of the sentence that correlate to the illustration underneath. Now, you are probably wondering, ok great how did she teach them how to do this on their own?! Good question!! We have done a lot of practicing first on using each specific conjunction at a time and identifying when to use each one. 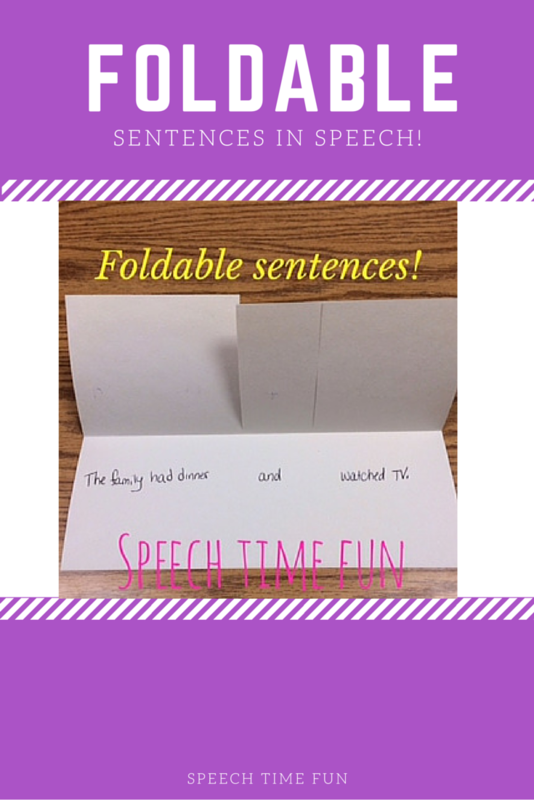 We made this one foldable after drilling TONS of “and” sentences. I taught them that when you are adding or combining (hence the + sign on the front of the foldable), then you use the word “and.” I took pictures or short passages (depending on the students levels) and had students describe them to answer questions. “What was the family doing?” “What does the boy have?” Then the students used their foldables to answer my questions using their compound sentences! My students had so much fun illustrating their foldables! Do you use foldables in your therapy room? How do you use them? How do you work on sentence structure, combining sentences, or teaching conjunctions?! Like this DIY idea?! Check out my foldables FREEBIE in my TpT store by clicking HERE! !